In the villages of Afghanistan, many young men are working for the government during the week, but fighting for the Taliban at weekends. "We don't get paid," says Gul Mohammad. "It's voluntary - all for the sake of God. We even buy fuel for the operations ourselves. And our own ammunition and bullets." 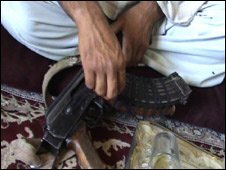 Gul Mohammad (his name changed to protect his identity) is not what you might think of as a typical Taliban fighter. He is educated, in his 20s, married with children and, during the week, he works in a government office. "I'm a civil servant - that's how I support my family, with my salary and by growing wheat, here in the village. "At the same time, I work for the Islamic Emirate (the name the Taliban use for their regime in Afghanistan). I've been fighting for the Taliban for about two years." Gul Mohammad is one of an unknown number of Afghans who work in a government office during the week and commute home to their village at weekends to see their children and fight for the Taliban. He lives in Wardak Province, which lies just to the west of Kabul. Its capital, Maidan Shah, is a 20-minute drive from Kabul. He says he has no trouble combining office work and Taliban duties. The phenomenon of weekend jihadis raises many questions - not just about how to maintain the security of Kabul and provincial capitals, but also how the insurgency will reach an end. Most Taliban fighters in his area are young men, says Mohsin (name changed to protect identity), who is also from the district of Wardak. He says many are civil servants. "People working in Kabul or the provincial capital, who have land and families in the villages, need to show they support the Taliban. "They provide manpower or contribute in other ways like giving top-up cards for mobile phones or financial assistance. They need to be able to keep commuting from village to work." According to Mohsin, it is not just individuals who split their loyalties in order to survive what feels like a civil war. "It's a secret in the village - there are people who are seniors in the Taliban and their brothers are seniors in the Afghan administration - they are aware of each others' activities and their involvement, and this is accepted as a matter of fact." Motives for joining the insurgency vary, he says, from religious fervour to national honour to an eye for making money from kidnapping, or looting from the enemy. In some places, villagers are intimidated and threatened into helping the Taliban, but in his area, Mohsin says support is genuine and has grown because of specific local grievances. "After 2001, people were very optimistic that peace and stability would come - that we would see a proper government that would attend to the needs of people," he said. "In the first year or two, people were waiting, but it didn't happen. Taliban had reappeared in the area - trying to reorganise their old comrades, but people didn't support them. "Then, as they saw the government becoming more inefficient, corrupt and indifferent, they started tending towards the Taliban." Both Gul Mohommad and Mohsin claimed endemic corruption in government is behind popular discontent, but Mohsin said the spark for the insurgency was the appointment of a particularly predatory police chief to the district. "Imagine - during the day, the police are police and at night, they are robbers. They plunder people's houses, they loot the bazaar and kill innocent people. "People became very angry. They stood against him and his group. And the Taliban grabbed this opportunity. They attacked the district headquarters and, until now, it's under Taliban control." The governor of Wardak, Abdul Haleem Fedaee, who was appointed a year ago, says he cannot reject or confirm the existence of Taliban elements in the state. "But we have intelligence agencies who monitor the civil service and we have other people - elders and clerics - who would also identify anyone who was fighting with the Taliban," he said. He said some civil servants may support the Taliban with money or mobile phone cards, but said they tend to be intimidated and terrorised into helping. Fighting in Wardak has been fierce this year. The US' counter-insurgency strategy is to take areas from the Taliban by force, protecting civilians from the insurgents and allowing the Afghan government to expand into the newly "liberated" zones. Mohsin says American action has just led to more anger. "In our area, Americans have made their base in people's houses. They have blocked the road for 5,000 houses and they have blocked water for an irrigation system that serves a large agricultural area and water for the mosque. "They have started to cut trees on both sides of the road to stop ambushes. People used to think foreign forces were here to ease life and help them - but now their presence is problematic." Gul Mohammad says he had not seen a waning of popular support for the weekend jihadi. "The people are helping us from the bottom of their hearts. During the fighting, they give us food. They help us with economic and technical problems." He says he will keep fighting during his spare time until the foreigners leave. "We will win - not because of planes and soldiers, but by the will of God."